New recreational fields are coming to the site next spring. City leaders plan to hold a ceremonial groundbreaking for new multipurpose recreational fields at the Robert F. Kennedy Memorial Stadium campus on Wednesday as the inaugural piece of the sports complex’s $489 million redevelopment. Twenty-seven acres of asphalt parking lots will be transformed into community amenities, according to Events DC, the District’s sports and entertainment authority. Construction is expected to begin in September and be completed next spring. The redevelopment plans call for 217,000 square feet of recreational fields that will be used for soccer, baseball, and lacrosse. The fields will lie next to a new picnic and playground area and connect to the existing Anacostia Riverwalk Trail and pedestrian/bike paths. They are estimated to cost $32 million. They will also be built on what is currently Parking Lot 7 of the RFK site, just to the north of the stadium. D.C. United played its final home game at RFK Stadium last October before the club relocated to the new Audi Field in Buzzard Point. Eventually, the old stadium will be demolished. 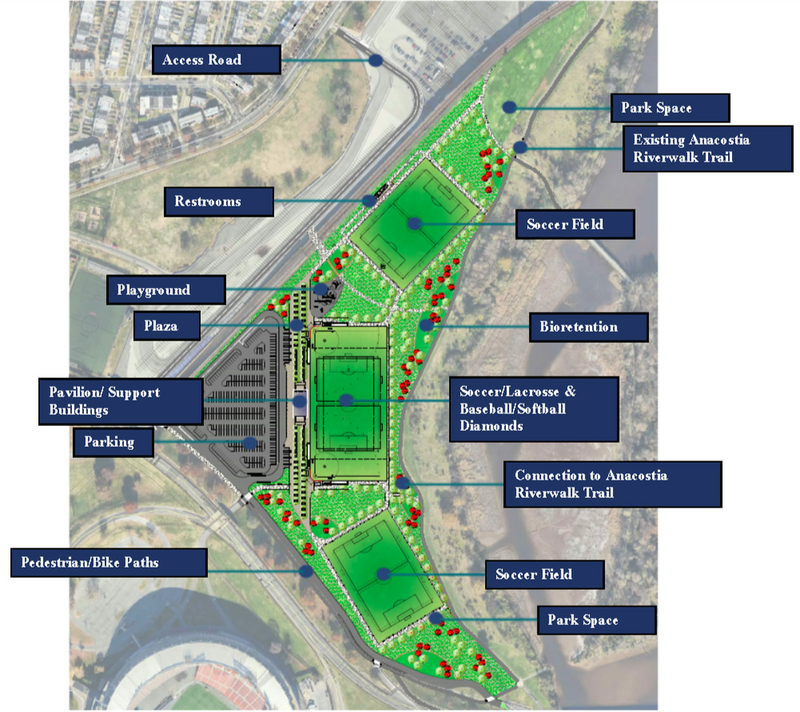 The overall redevelopment of the 190-acre RFK campus will additionally include a 47,000-square-foot market hall for food vendors, a 350,000-square-foot indoor sports and entertainment facility, three pedestrian bridges going to Kingman and Heritage islands on the Anacostia River, and a memorial to Robert F. Kennedy. The federal government owns the RFK campus, but last year, the District formally asked for control of the land. The District’s current lease with the National Park Service allows for only recreational and sports uses instead of residential or commercial uses at the campus. Were D.C. to own the site, it could build mixed-use projects or a new professional sports stadium. The official ceremony will take place on Wednesday at 10 a.m. Mayor Muriel Bowser, Events DC President Greg O’Dell, and Events DC Chairman Max Brown will preside.